Pablo Piatti will stay at Espanyol as they triggered the option to buy him. The fee is €1.5m. Matthew Ryan signs a 5 year deal with Brighton after he return from his loan at Genk. We got a €6m fee for him. After he turned down two offers from Premier League Enzo Pérez signs with River Plate. He wanted to go home and we got a deal for him at €5m. Aderlan Santos will go for loan at Sao Paulo until 31 December 2018. There are also a buy-out clause in the deal. Zakaria Bakkali will go to Deportivo La Coruna on a loan until the end of the season. Álvaro Negredo was sold to Besiktas for €2.5m. Yoel Rodriguez signs for the same club that he spent last season on loan. He will go to SD Eibar for a fee of €675k . Alvaro Medrán joins Antonio Sivera and Nando at Alavés on loan. The goalkeeper and the winger sealed a permanent deal with an achievable buy back options for Valencia. Nani joined Lazio on a loan with option to buy, while Joao Cancelo joined Inter on loan with a buy option as well. All in all 21 players left Valencia during the window. Players that’s ending their time at the club and returning home are Siqueira, Mangala, Munir and Suárez. Simone Zaza becomes a permanent signing after his 6 month loan from Juventus. He signed a contract to keep him at Mestalla until the summer of 2021. The transfer fee was €16m and can be increased with another €2m. The fee will be paid in two financial years. Fabián Orellana also becomes permanent after his loan on a buy-out clause. He extends his contract to the summer 2019 and the transfer fee is €3m. Nemanja Maksimovic signs a contract over five years on a free transfer from FC Astana. Norberto Murara Neto signs a four-year contract. He costs €7m plus €2m in bonuses. Gabriel Paulista joined for 12 million euros from Arsenal, while he is accompanied in the defence by Jeiseon Murillo from Inter on loan with option to buy. Goncalo Guedes and Andreas Pereira both joined on loans without options to buy on the final day of the market from PSG and Manchester United respectively. Nacho Vidal, Nacho Gil, Lato, Javi Jiménez and Alex Centelles have all been given numbers for the first team. Those with numbers over 25 are registered so that they can alternate with Mestalla. 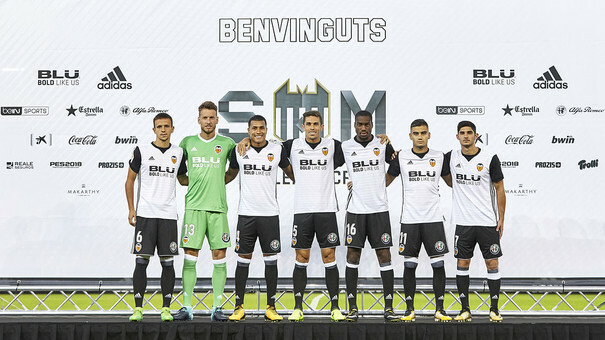 All in all, while improving the team, Valencia has also saved 24 million on the Financial Fair Play budget, likely enough to have room for a striker signing in January.